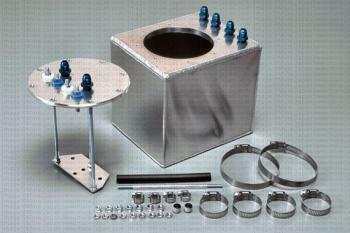 SARD Fuel Collection Tank UNIVERSAL - Dezod Motorsports Inc - Home of the automotive performance enthusiast since 2002. There are fuel delivery issues when using the factory tank in a racing application, where high lateral g’s can cause the fuel to ‘slosh’ around and the fuel pickup can be starved of fuel. The fuel collector tank can eliminate this effect, and can also offer the option for running two fuel pumps.